The fiber optic cable connectors do the job of mating or connecting with optical fibers, modules, and devices. They are one of the key components in optical communication. Connectors used for fiber optic cable terminate the end of a fiber. They are quicker than splicing regarding connection and disconnection. Their primary function is to allow the passing of the light through the fiber cores. Good fiber optic connectors keep the loss of light because of misalignment of the core or reflection to the minimum level. Fiber Optic Cable Connectors: Where are They Used? 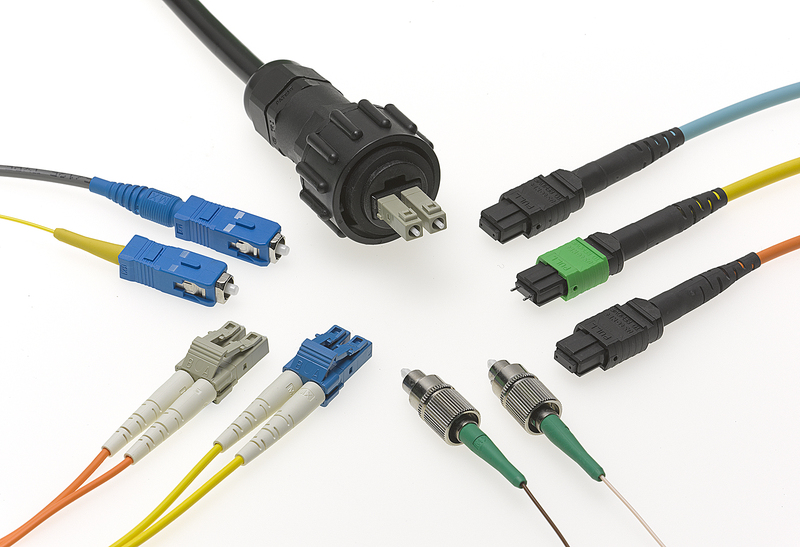 Common fiber optic connectors are used in various types of military, industrial, telecommunication, data processing, and other applications. Different manufacturers have designed and produced many kinds of connectors since the beginning of the fiber optic technology. Approximately 100 types of connectors are available in the market, and they differ from each other in dimensions and methods of mechanical coupling. Arguably the most popular connector for multimedia networks in both residential and commercial applications, the ST connectors bring durability and reliability in field installation through their bayonet twist-lock mount and the 2.5 mm cylindrical ceramic or polymer ferrule. Available in both singlemode and multimode versions, these spring-loaded connectors are required to place correctly to reduce loss. Available in both simplex and duplex versions, they are snap-in connectors that utilize a push-pull connection design. Their 2.5 mm zirconia ferrule is suitable for quick patching of fiber cables into wall or rack mounts. They are singlemode connectors that are used for non-optical disconnection in telecommunication applications. Their pre-radius ferrule and coupling thread ensure low back reflection and durability in installation. With a 1.25 mm ferrule and a pull-proof design, LC connectors utilize a latching mechanism to ensure steadiness in system rack mounts. They are almost half of the size of the SC connectors, which makes them ideal for high-density applications. Looking like a miniature SC, MU is a small size connector with a 1.5 mm ferrule. It is able to provide high performance in high-density connections. These are duplex connectors that make use of an active latching mechanism and a free-floating 2.5 mm ferrule structure. Some other common types of fiber optic cable connectors are FDDI, Biconic, D4, MTP, Opti-Jack, Volition, MPO, and more. Previous Fiber Optic Splicing: Which Type Is Better?